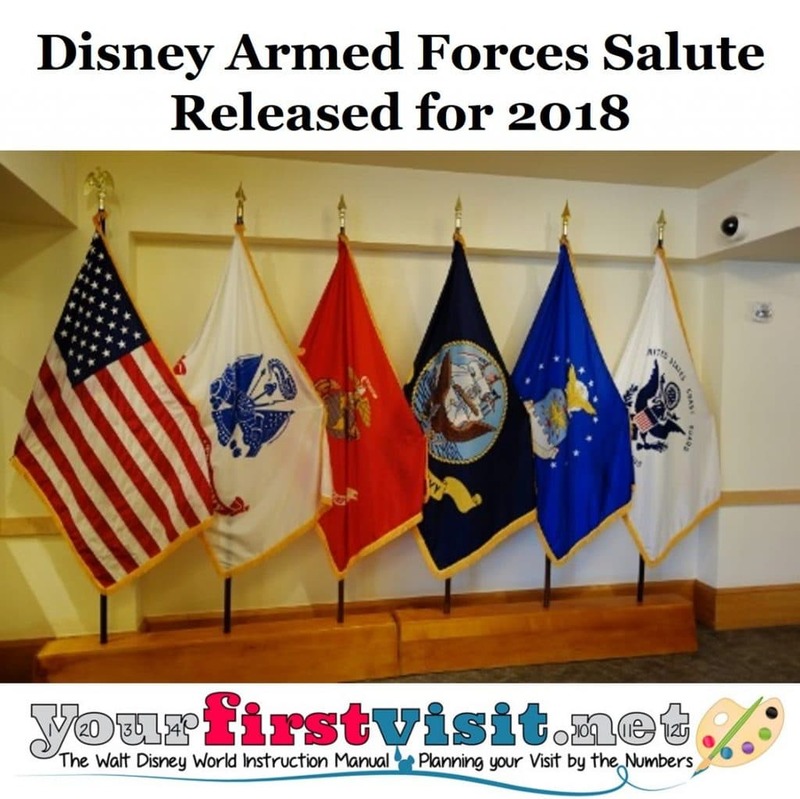 As Steve announced on MilitaryDisneyTips.com, the 2018 Disney Armed Forces Salute became available Thursday. As in 2017, it includes not just deeply discounted 4 day tickets, as it has the past few years, but also deeply discounted 5 day tickets. Unless your kids are younger than 5, the 5 day option is the one to choose, as it permits two days in the Magic Kingdom and a day each in the other three parks. Also available again as part of the 2018 salute are room discounts of approximately 30% to 40% off . Some of the most popular room types (e.g. Little Mermaid rooms at Art of Animation) may be excluded, and availability elsewhere is very limited (more rooms may be added). I’ll publish more details I understand them, but frankly the best starting point for understanding the deal is Steve’s page here. The ticket deal is available only directly from various base sources. But Kelly can book the room rate deal for eligible military families. Contact her at KellyB@DestinationsInFlorida.com or 980-429-4499. 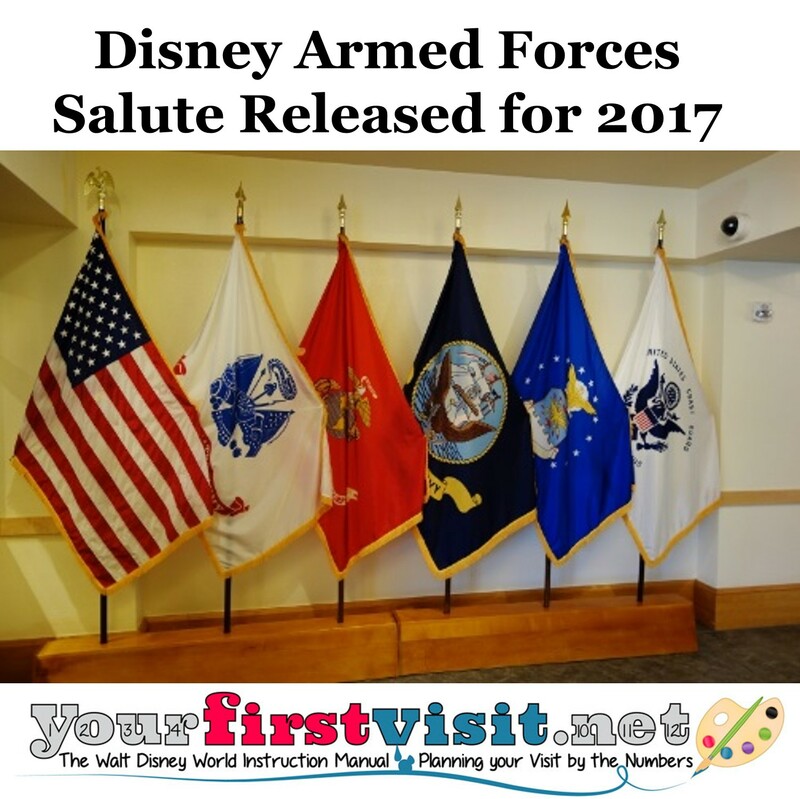 As Steve is reporting on the MilitaryDisneyTips.com Facebook page, the 2017 Disney Armed Forces Salute became available today. The salute is valid from January 1, 2017 through December 19, 2017, but excludes April 9-23. For 2017 it includes not just deeply discounted 4 day tickets, as it has the past few years, but also deeply discounted 5 day tickets. Unless your kids are younger than 5, the 5 day option is the one to choose, as it permits two days in the Magic Kingdom and a day each in the other three parks. Also available again as part of the 2017 salute are room discounts—30% off value resorts, 35% off moderates, and 40% off deluxes. Some of the most popular room types (e.g. Little Mermaid rooms at Art of Animation) are excluded, and availability elsewhere is very limited (more rooms may be added). S0 those aiming to use the room rate deal for a visit before May (remembering the excluded April dates!) should book right away. The ticket deal is available only directly from various base sources. But Kelly can book the room rate deal for eligible military families. Contact her at KellyB@DestinationsInFlorida.com or 980-429-4499. 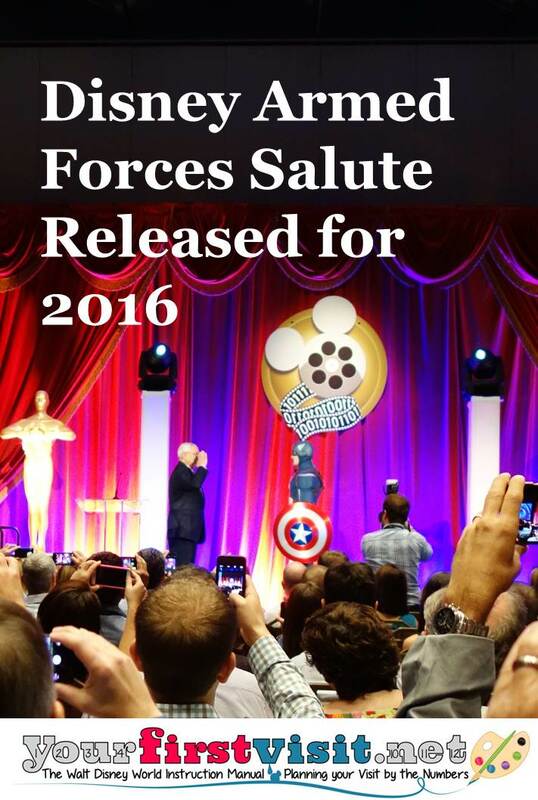 Miltiary families and their friends will be delighted to know that my friend Steve Bell has broken the news at Military Disney Tips that today Disney’s Armed Forces Salute has been extended into late December 2016. 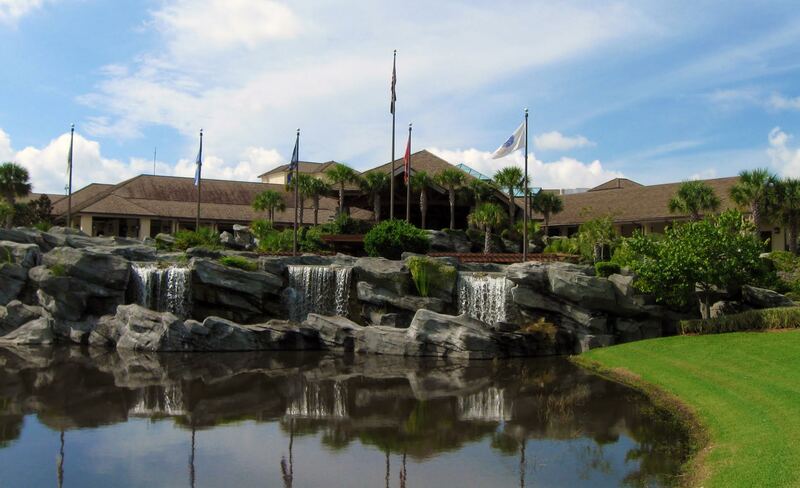 Discounts on eligible Disney World resort hotel rooms. Eligible military families can select one or both, but can’t combine them with any other deal. You can also use the Military Salute tickets and stay at Shades of Green. My friend Kelly B can book the room-rate part of this deal for you. Contact her at 980-429-4499 or kellyb@destinationsinflorida.com. Eligibility for these and other Disney military deals has always been complicated, and the process for getting and using some of them even more so. Steve’s Military Disney Tips has always been the go-to site for military families looking to make the most out of their Disney World vacations. But like every other website (especially mine), finding exactly what you need to know, in the right order, sometimes isn’t as easy as you’d like it to be. So the great news is that Steve has just published a Disney World guidebook for military families. With entire chapters devoted to the 2016 salute, to Shades of Green, and to other deals and perks available to military families, I can’t recommend it enough!! 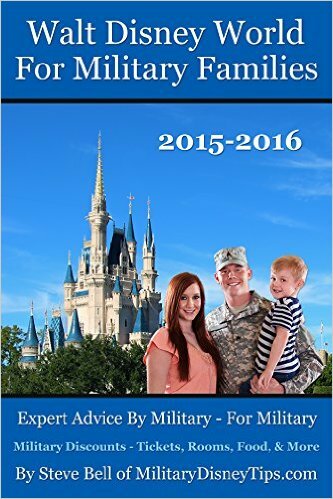 This book will be a great help to military families contemplating a Disney World visit in 2016!! As noted above, Kelly B can book the room-rate part of this deal for you–but not the discounted tickets. Contact her at 980-429-4499 or kellyb@destinationsinflorida.com. See Steve’s material here for important details! Friend of the site Kelly B can book Armed Forces Salute room discounts. Contact her at 980-429-4499 or kellyb@destinationsinflorida.com. And, for qualifying trips Kelly and her agency, Destinations in Florida, will get you a free copy of The easy Guide to Your First Walt Disney World Visit, the best-reviewed Disney World guidebook in history, after it comes out later this year! Kelly cannot book Armed Forces Salute tickets–just the room deals. If you are military folk and don’t know Steve Bell, you should. He writes Military Disney Tips and its blog, is the author of an ebook on Shades of Green, and is an expert on and advocate for military families making the best of their Disney and Orlando trips. Steve is also the military moderator for this site. For all these reasons, but especially his unmatched expertise on Shades of Green, I asked him to write about which Shades of Green amenities can be enjoyed by military families who aren’t even staying there. Military folk aren’t staying at Shades for one of three reasons: they prefer an alternative; one of Disney’s deals is just too attractive; or they didn’t find out about Shades until it was too late. But whatever the reason, there’s still much at Shades of Green open to them wherever they are staying!! At Shades of Green you will find all of the amenities that you’d expect at the best Disney resorts such as a wide selection of restaurants, recreational options, valet parking, bellhop service, spa, fitness room, two pools, free Wi-Fi, and self-service laundry facilities, plus a military discounted ticket sales office and mini Exchange. Did you know that you can use many of Shades of Green’s amenities even if you are not staying at Shades? You may be a WDW day guest, staying at a Disney owned resort as yourfirstvisit.net recommends for first time Walt Disney World visitors who may never return, or you may be doing a “split stay” between Shades and a Disney resort. In all cases as a Military/DoD member you are always welcome to stop by Shades of Green. At least one member of the party must have a military ID, CAC or DoD CAC to use its amenities. Exactly which amenities are non-Shades guests allowed to use? All of these cost less than the comparable services at the Disney resorts and there is no sales tax added! Other amenities such as pool and fitness center use are reserved only for those actually staying at Shades. With the introduction of WDW’s FastPass+ it has become best to purchase your Disney tickets well in advance. Those staying at Shades can do so ahead of time through its ticket office. Those who do not care about FastPass+, and day guests, can stop by to buy their Disney World tickets here. The line for service can be long in the morning, so drop by in the afternoon for a shorter wait. The Army Air Force Exchange Service operates what is essentially a shoppette at Shades of Green. Here you will find all of the sundries that you might need during your vacation. Some of the offerings are: all kinds of snacks and quick food options, a wide range of beverages (general consumption and adult -beer, wine/liquor), toiletries and medicines, Disney, Orlando and the various services souvenir items. 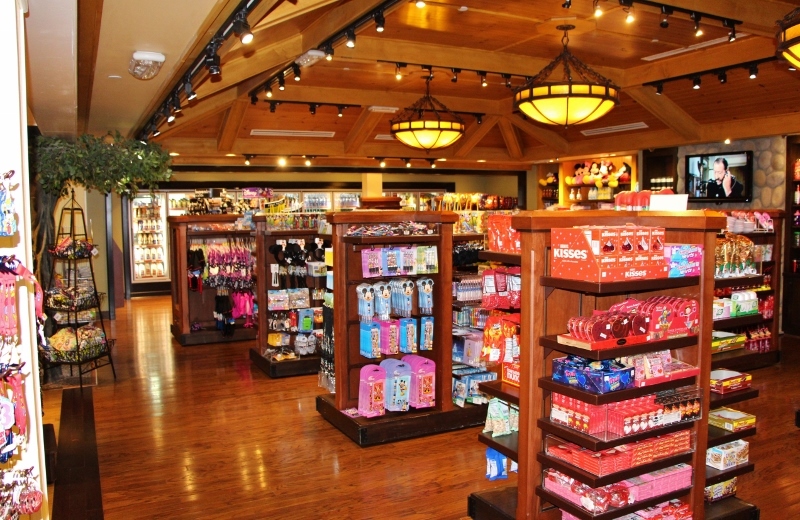 This is a great place to stock up on snacks and drinks for the room and theme parks at good prices. 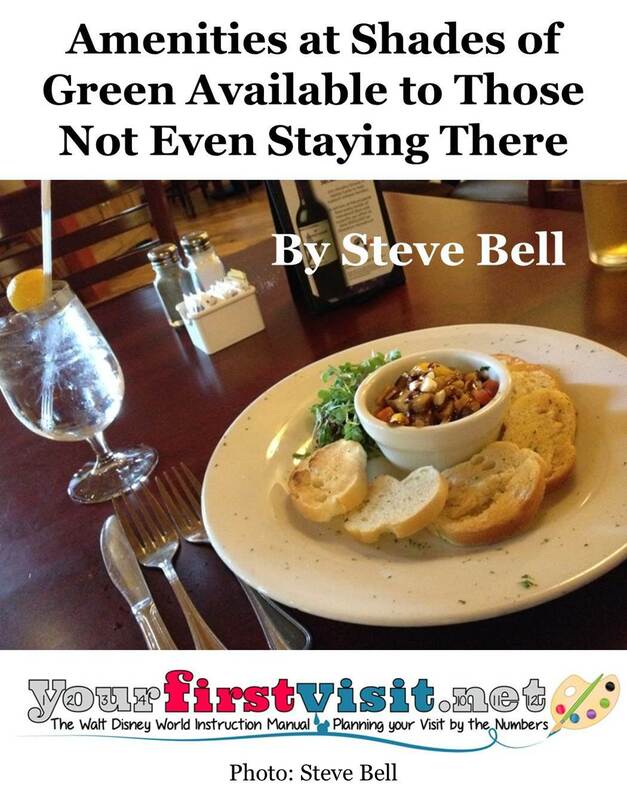 You are always welcome at Shades of Green’s restaurants. 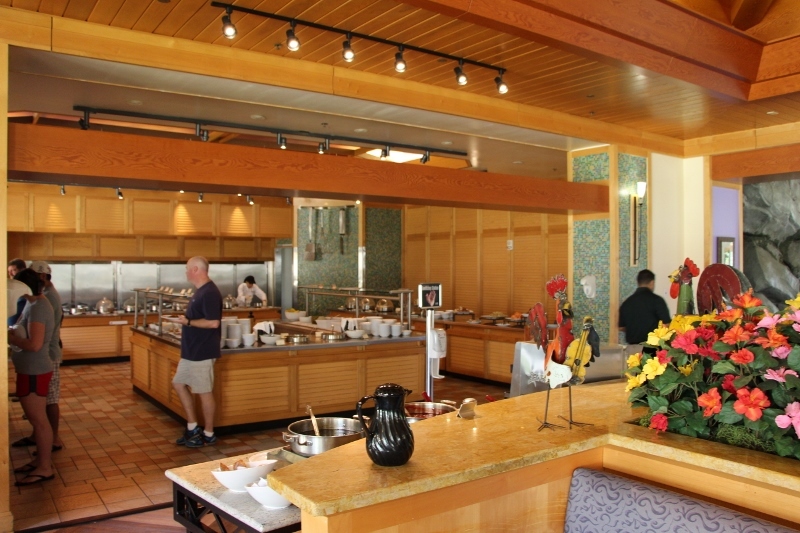 Breakfast options are the Java Café and Express Café, both quick service (grab and go) locations, and the Garden Gallery buffet, which often has long lines for breakfast. For lunch your options are the Java Café (Starbucks pastries), the Express Café which has great sandwiches, On the Greens Grill offering hot dogs and brats by the Magnolia Golf Course, Manginos Italian Restaurant (table service), and Evergreen Sports Bar on the weekend. If you are around for dinner you can choose from the Garden Gallery which offers a regional/international buffet with daily rotating items, Manginos Italian Restaurant, the Java Café (Starbucks pastries), the Express Café, and Evergreen Sports Bar. Shades of Green’s dining locations are cheaper to considerably cheaper that the corresponding Disney venues, so drop by here to get filled up. 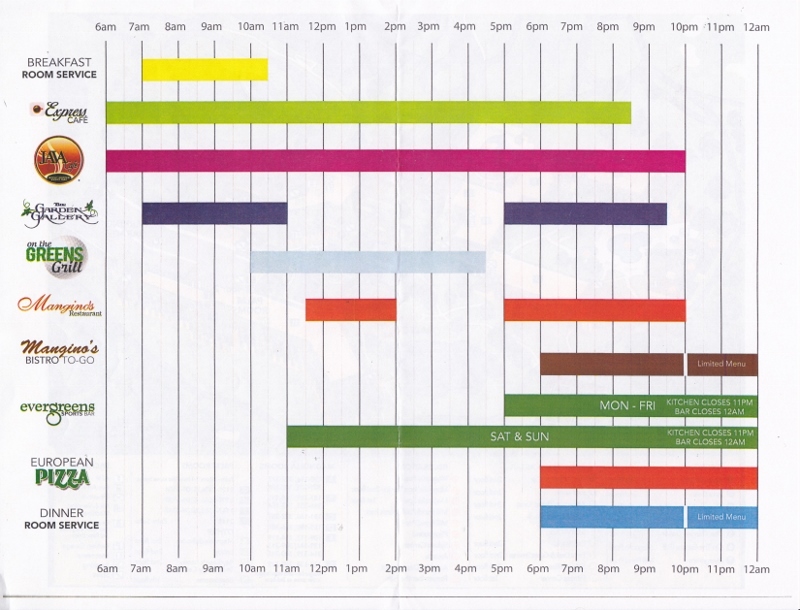 Shades offers a handy chart indicating what is open when during your visit. 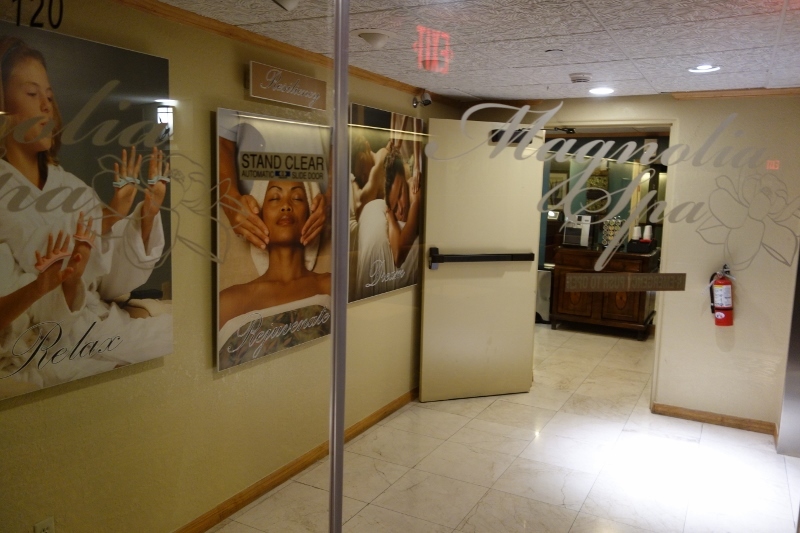 The Magnolia Spa is a full service spa operated by Niki Bryan Spa, which operates the WDW Spas. The full list of services and prices is here. If you have your own car the easiest thing to do is drive yourself. Follow the signs to the Magic Kingdom. 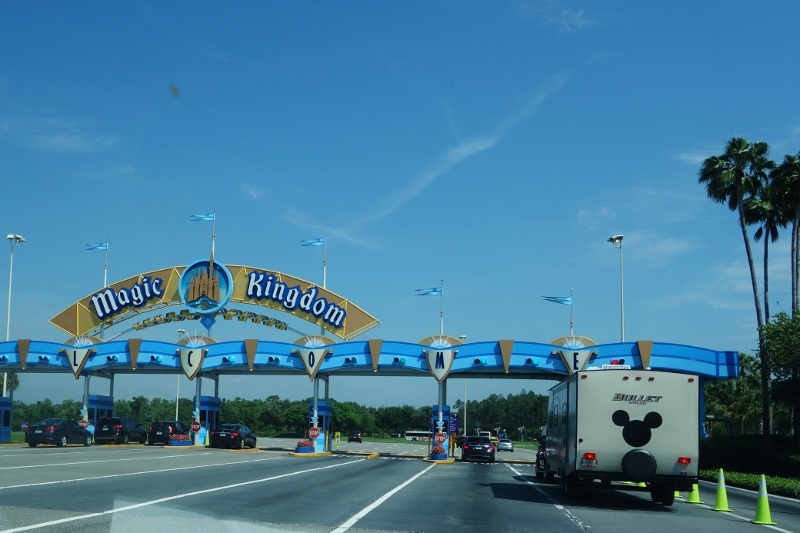 When you arrive at the parking toll booth get in the furthest right lane that you can [Dave: where the camping trailer with its subtle Hidden Mickey is in the photo]–the very far right lane is reserved for Disney buses). Then tell the parking cast member that you are heading to Shades of Green. They’ll let you pass without paying for parking. Merge right then drive straight ahead following the single lane, rather than the multiple lanes curving to the left to parking. Get into the left lane and turn left at the first stop light. Follow this road past the Polynesian Village Resort on the right and then turn right at the “T.” Shades will be just ahead on your left. At the guard shack just show your ID (military ID, CAC or DoD CAC) and tell the security host what you are there for i.e. “I’m going to the ticket office to buy tickets.” They’ll then direct you to parking. If you are depending on Disney Transportation you have a couple of options. You can take Disney transportation to the Polynesian Village Resort or Transportation and Ticket Center and walk to Shades. From the Poly, it takes about 10 to 15 minutes depending on your walking speed. Add another 5 to 10 minutes from the TTC. Or, with a military/DoD ID for everyone in your party, you can use Shades of Green’s transportation. You’ll first need to get to one of the Shades of Green drop off/pick up spots (at the TTC, Disney Hollywood Studios, Animal Kingdom, both water parks, and Downtown Disney). The Shades bus will then take you right to the resort to run your errands. When finished just take the Shades bus to your desired destination, or walk to the Poly or TTC to use the transport options there. Using these extra benefits available at Shades will help you save a little extra on your vacation. You are eligible, so if you have the time to stop by, you should definitely use them. Drop by to pick up supplies, buy any tickets you still need, and grab lunch. Thanks, Steve! This is great info for military folk not staying at Shades!